Park Farm Pumas Black Under 15s are pictured before their 5-0 win over Stanground Sports in the PFA Cup. From the left they are, back, Joshua Stocks, Akinola Ojelade, Callum McAuley, Andre Ojo, Domenico Ciani, Daniel Sot, Gediminas Kozik, Lacko Stanislav, front, Finley Sciara, Leon Ofosu, Ethan Cole, Sonny Kulscak, Ben Lane and Edison Hoda. 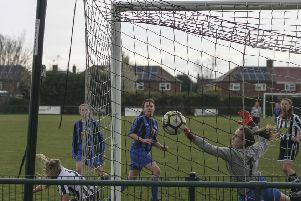 There were no surprises in the quarter-finals of the Under 18 PFA Cup with the top four teams in Division One of the Peterborough Youth League all progressing. Mind you, Yaxley Lynx had to rely on a penalty shoot-out to get past Division Two title-chasers Hampton. Stanground Sports Under 15s are pictured before their 5-0 PFA Cup defeat by Park Farm Pumas Blue. From the left they are, back, Michael Fearnhead, Josh Forman, Ben Muchina, Josh Lovelock, Liam Killingray, Josh Borgognoni, Ewan Brisley, Rob Borgognoni, Martin Tuffnell, front, Oshea Nembhard, Ciaran Somers, Cameron Fearnhead, Kieron Smith, Thomas Tuffnell and Brandon White. They won 5-4 on spot-kicks after a 2-2 draw in which Sam Royle and Liam Sanderson scored for Yaxley and Logan West-Ley and Brandon Orchard for Hampton. Unbeaten Division One leaders Peterborough Sports beat ICA 4-0 with strikes by Ayman Trabelsi (2), Benjamin Romaine and Eunis Lievins while their big rivals Deeping Blue won by the same score at Spalding thanks to goals by Scott Waumsley (2), Rodrigo Goncalves and Jared Carver. In the fourth quarter-fnal , March Soccer School won 7-4 at Thorpe Wood Rangers even though they had Luke Cable and Charlie Revell sent off. Robert Conyard led the way for March with a hat-trick while Matthew Robson hit all four Thorpe Wood goals. Action from the game between Stanground Sports Under 15s and Park Farm Pumas Black. In the Under 15 PFA Cup, the quarter-final tie between Peterborough Sports and Werrington Athletic Blue was abandoned with 23 minutes left and Sports leading 2-0 after Werrington keeper Ben Asplin suffered a badly broken leg. In the other two ties played there were wins for Oundle Town (8-1 against Northern Star White) and Park Farm Pumas Blue (5-0 against Stanground Sports). Owen Dalliday scored three for Oundle. Oundle Under 13s went to town in the Junior Alliance League on Sunday. The were at home to bottom team Gunthorpe Harriers Navy in their latest Division Three fixture and sunk their rivals by a whopping 19-0 margin. Leading the way with a six-goal haul was super sub James Aubury closely followed by True Holmes with five. That took Holmes’ tally for the season to 35 goals from 13 games and Aubury has 17 from 10 starts. Completing the Oundle goal tally were William Seymour (2), Freddie Gilder-Smith (2), Joseph Deegan, Jamie Dexter, Samuel Taylor and Seth Barker. Another Under 13 player with his shooting boots on on Sunday was Reuben Marshall. He put four away for March Town Athletic in their 6-1 win over Stamford Young Daniels in Division Two. There was better luck for Stamford Young Daniels in Under 14 Division One. They beat Leverington Sports 5-2 to narrow the gap on leaders Nethaton to two points. Alex Sinfield netted twice.